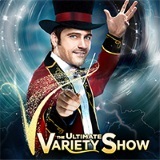 The Ultimate Variety Show is like seven shows rolled into one featuring fun, fast-paced specialty acts mixed with daredevil stunts to keep you on the edge of your seat. E! Entertainment calls it the “perfect show for the entire family.” Each cast member in V – The Ultimate Variety Show is a master of his or her craft… skills, techniques and performances that have taken decades and in some cases generations to develop and perfect. From well-known industry entertainers to newcomers from shows like American Idol and America‘s Got Talent, all acts are carefully selected to make sure they bring a unique experience to the stage - giving the audience everything they want all in one show from comedy and magic to aerial artists who fly out over the audience. V Theater inside Miracle Mile Shops at Planet Hollywood Resort & Casino.